Yep I've been at it again! 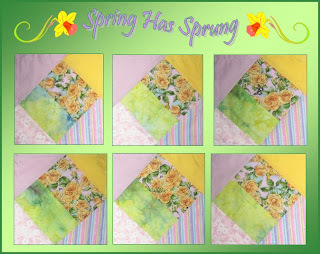 This evening I was back playing with fabric and got put together both my Spring Has Sprung and Summer Dreams naked blocks completed :). Of course like the Fall ones these may not necessarily be all in the same direction as again I made them all the same.. .it's so much quicker this way! LOL Not to mention there's less waste of fabrics and thread as I can go thru each block and put the first seam in each one and then clip smaller threads. The Spring one will have a green background though I'll have to go on a search for the fabric as I don't have in what I want to use. 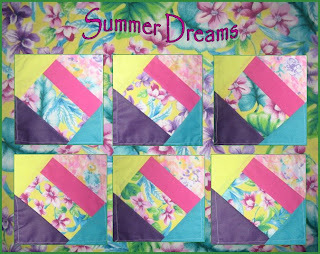 The Summer one will have the same flower print with the sunny yellow background as in the blocks which is why I made sure that one wasn't on the edge of the blocks.